Optoma knows what a drag it can be to have your favorite video content locked away inside the tiny screen on your iPhone or iPod: it’s great for you and you alone, but as soon as you want to share it with friends, the screen and speaker just let you down. 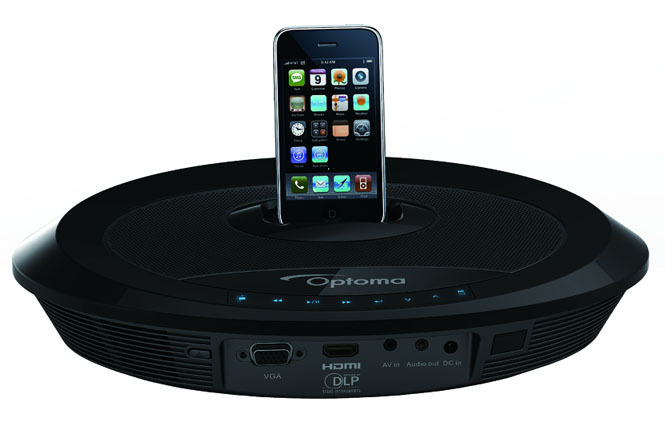 To that end, Optoma has announced the new Neo-i iPod dock, which not only offers a speaker system so everyone can hear your iPod content, it also packs a 50 ANSI Lumen pico projector that can throw your images and video content onto a nearby wall, screen, or other surface for everyone to enjoy. Although Optoma doesn’t consider the Neo-i a portable device, it’s not exactly huge, measuring 12.8 inches by 8.9 inches and 3.1 inches tall, and weighing just over 2.5 pounds. For all that comparative bulk, users get a two-speaker bass reflex system designed to offer users surprising perception of bass and dynamic range, along with that 50 Lumen pico projector that can pitch an image up to 120 percent of native WVGA size (854 by 480 pixels) in 16:9 format. Optoma says the projector offers a 2,000:1 contrast ratio and a bulb life of over 20,000 hours, and users can hook up other devices and video sources to the projector using a VGA and HDMI 1.3 input. The Neo-i also offers a 2.5mm AV jack and composite input, and while the system runs off an AC adapter it can also be run using an optional battery pack. 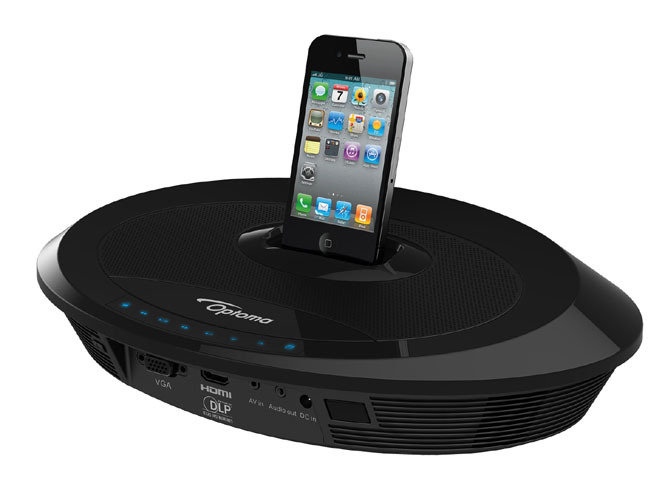 The Neo-i also offers a 30-pin dock connector, so it can handle (and charge) iPhones, iPods, and iPod touch devices. Once docked, users can control their iPods using an IR remote control (included) or the Neo-i’s front panel. Optoma says the Neo-i will go on sale in mid-December for a suggested price of $449.